Do you have a Lab? Are you confused by the many choices you have when it comes to picking a dry dog kibble? We've consulted with the experts and have narrowed down your choices to some of the healthiest dry kibble brands on the market today. Check out the best dog food for Labs. These are top-notch on Nolongerwild! How to Select the Best Dog Food for Labs? Choose From Our Top Picks! We've combed through the best dog foods on the market and have selected four to be our top picks. Check them out. 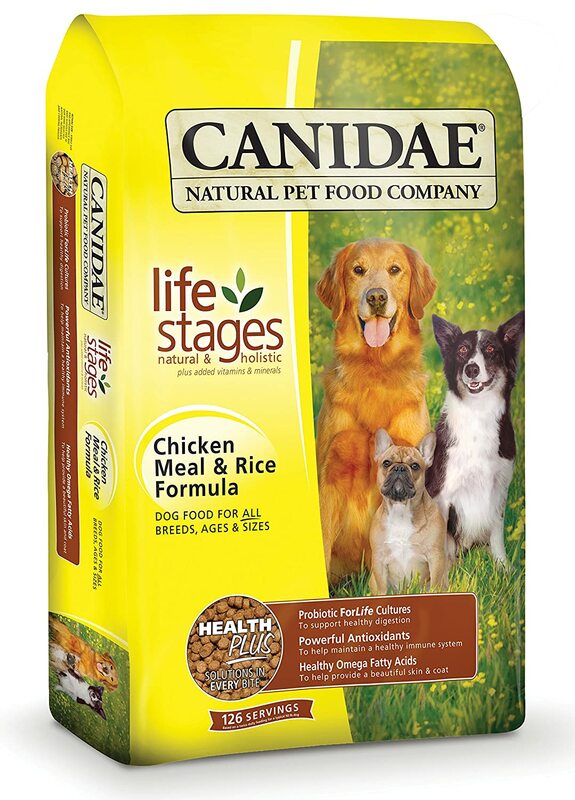 The Canidae company has taken every stage of your dog's life and have fitted a nutritionally balanced food for it. Whether your Lab is a puppy, adult, senior or even overweight, Canidae has you covered. Their meat protein is sourced from chicken, lamb, duck, turkey or fish and the kibble recipe contains none of those bad fillers (wheat, corn, soy). In addition, their unique HealthPLUS Solutions creates a powerful trio of great nutrition. The special cooking process ensures high levels of live probiotics for healthy digestion. Plus, the powerful antioxidants will help support your Lab's immune system, while the omega 3 and 6 gives your Lab a healthy skin and coat. 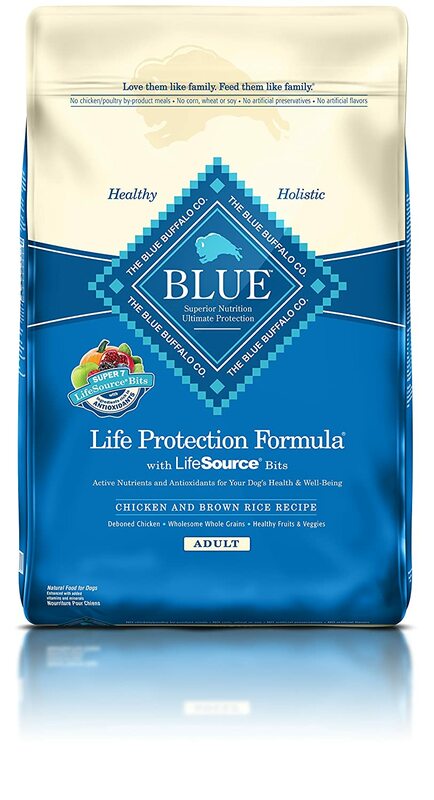 Made with deboned chicken, Blue Buffalo Life Protection brand dry dog food is one of the best on the market today. It uses absolutely no grain or cheap fillers in its recipe - a great choice for those energetic Labs - as it uses instead healthy brown rice, whole potatoes and whole ground barley as its carbohydrate source. 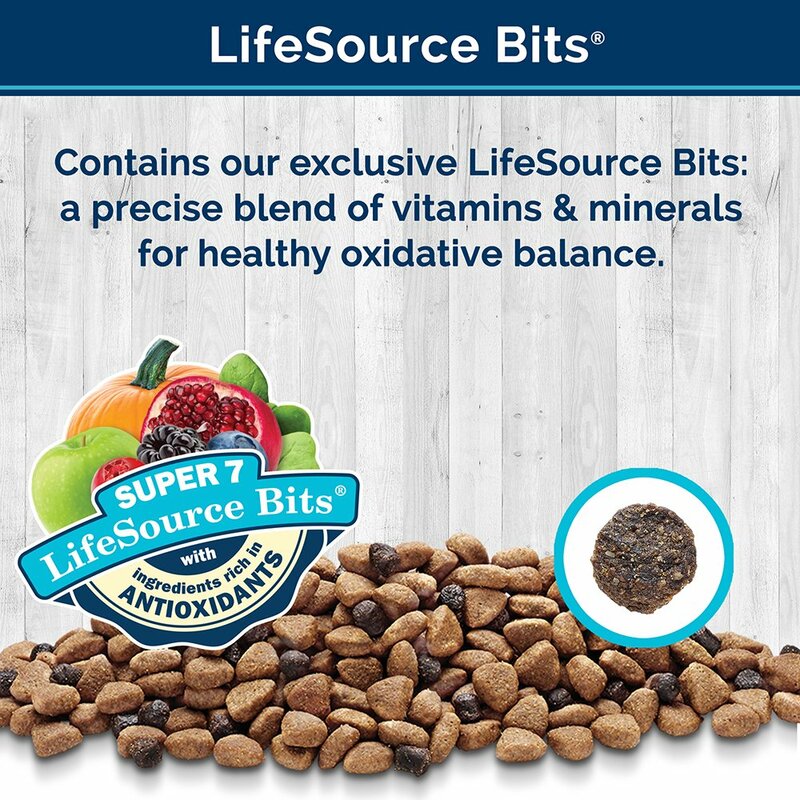 This company also has a unique addition to their food called LifeSource Bits. 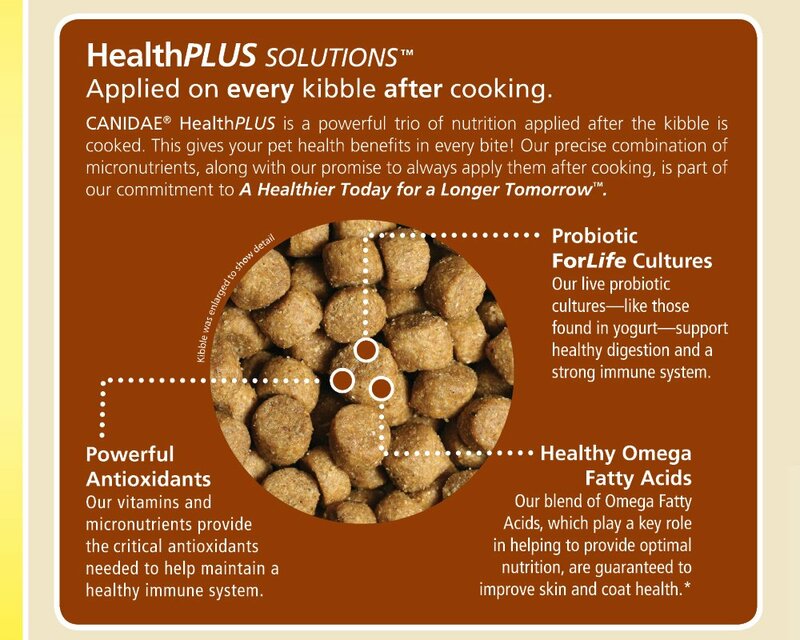 These individual kibbles are packed full of a precise blend of vitamins, minerals and antioxidants for added immune support. 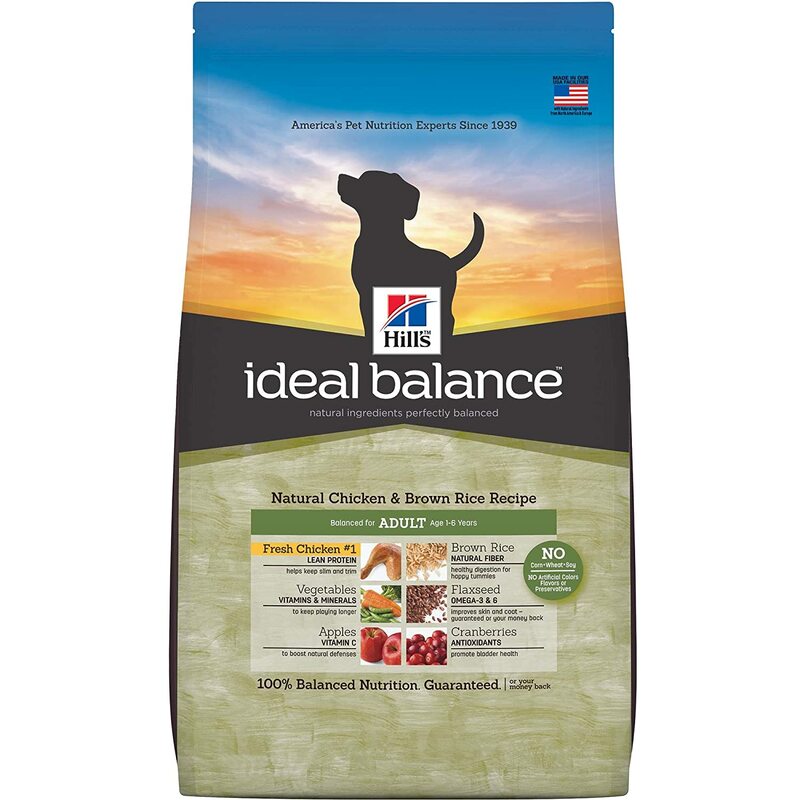 With over 70 years experience and the input of 150 veterinarians and pet food specialists, the Hill's Ideal Balance food is top-notch. 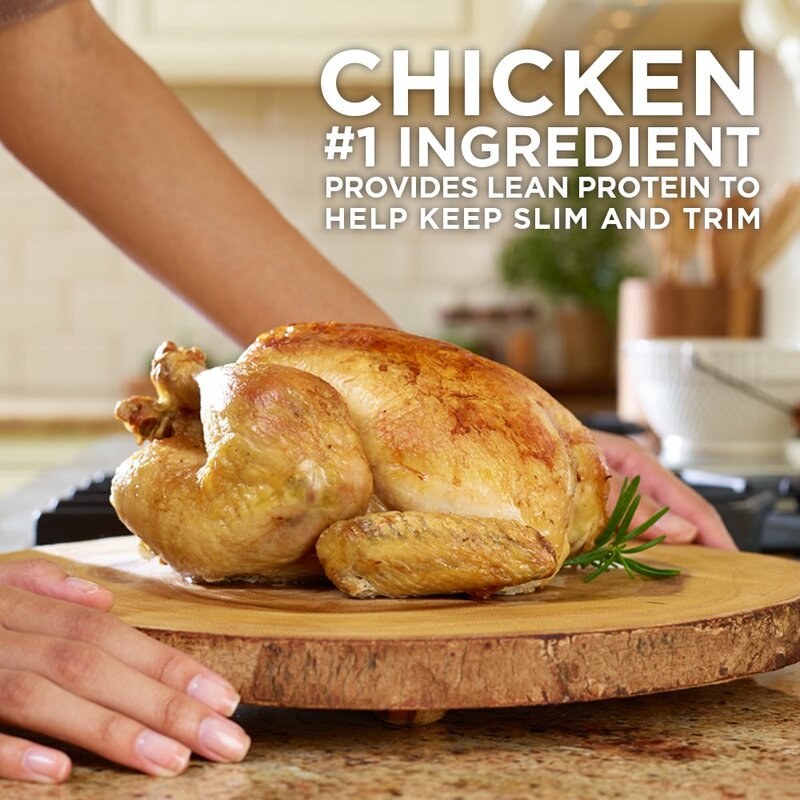 This company goes above-and-beyond the set standards of pet food by using only lean chicken in their recipe. The addition of good carbohydrates like brown rice, whole grain oats and cracked barley will give your Lab the energy to play all day long. Plus, it's healthy blend of garden veggies and fruit will keep your dog in overall good health. Has different foods for a variety of life stages. This is our number one top pick of the best dog food for a Lab. 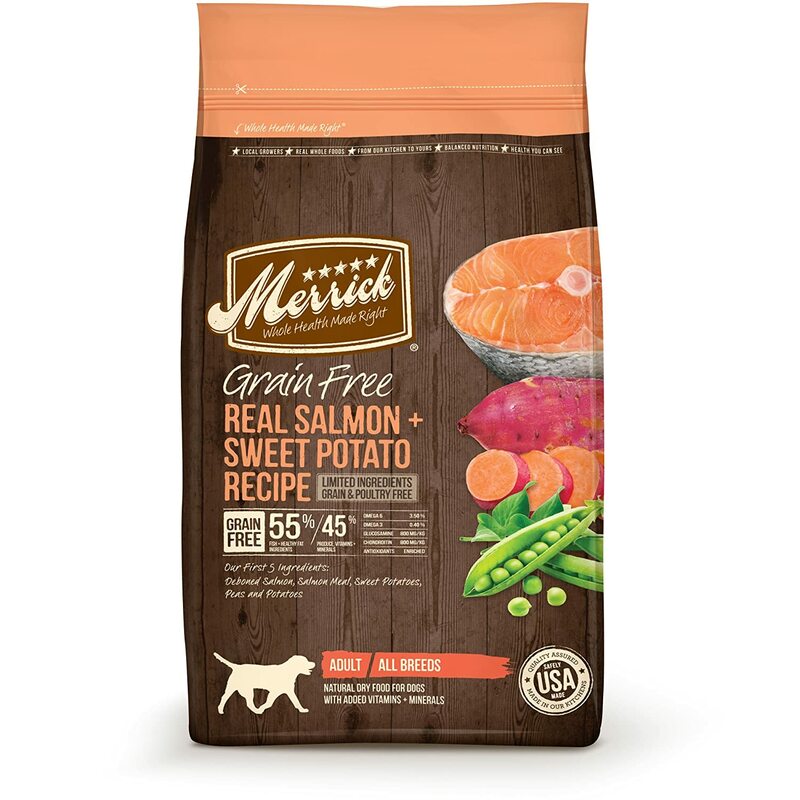 Merrick Grain Free dog food is setting the standards for other brands by only using fresh meats as their first ingredient. And speaking of meat, Merrick uses a variety of protein sources like rabbit, duck, chicken, buffalo, Texas beef, venison, turkey, lamb and salmon. The brand also includes other added benefits of natural ingredients such as sweet potato, blueberries, peas, carrots, apples and more. In addition, all the ingredients and the manufacturing are done in the USA. Labradors do have some special "needs" when it comes to their daily diet. Here are some tips on feeding the best dog food to your Lab. Labs tend to gobble down their food, this can lead to overeating, which can lead to obesity and a deadly condition known as "Bloat." Feeding your Lab smaller meals throughout the day can prevent this from happening. There are also special dishes that make your pooch "work" for the food. As we mentioned above, bloat can be a serious issue with Labs. This affects the stomach which flips over on itself, cutting off the blood flow and digestion. This dangerous condition can occur after your Lab has eaten a large meal, then runs or exercises vigorously. Always be sure to have plenty of fresh clean water available at all times for your Lab. This is especially important if you are feeding your dog a dry kibble only diet. These types of foods need the moisture to help your pet feel full and to breakdown properly for digestion. Since our dogs (including Labs) are thought to have (loosely) descended from the ancient wolf species, their diet should contain that in which they would find in the wild. This means mostly meat, followed by some plant protein that would naturally be found in the stomachs of their prey. Some dog food companies will use cheap fillers such as corn, soy or wheat to bulk up their kibble. This offers absolutely no nutritional value to your Lab's daily diet. In fact, these grains could be packing the pounds on your pooch and may even be partly responsible for dog diabetes. Meat and Identified Meat Meals Are IMPORTANT! Meat is obviously very crucial to the development of the Lab's muscles, bones and his entire system as a whole. Good quality meats in dog food should be listed as the first ingredient. This could be poultry, fowl, rabbit, venison, fish, beef etc. Don't worry if there is an identified meal (such as chicken meal) as the next ingredient as this is just highly concentrated, dehydrated meat. These contain high levels of protein (about 70%) and is perfect for giving your Lab the building blocks he needs to have a healthy body. Next for the best dog food for Labs should be a healthy whole grain source; whole grains are identified as those still containing the bran, germ and endosperm. These can be found in brown or wild rice and oats. Whole grains not only give your Lab the carbohydrates her needs for all that energy, but also for a good digestive system. A good quality grain will also regulate your Lab's blood sugar levels and give him very specific antioxidants that are not found in fruits or vegetables. In addition, these whole grains have also been said to lower your Lab's risk of getting more serious ailments such as some cancers, heart disease and high blood pressure. Fruits & Vegetables Are GREAT! Dog food companies are now realizing all the benefits added fresh fruit and vegetables provide for, not only your dog's overall health, but for the boost in the immune system and antioxidants they provide. Some examples of healthy fruits and vegetables found in dog kibble are blueberries, blackberries, cranberries, apples, peas, sweet potatoes, kelp, carrots and more. Lastly, a good quality dog food should include added vitamins and minerals. These are paramount for the development of healthy eyes, brain functions, cells and so much more. You will notice the vitamin and minerals listed further down the kibble formula list. These can include (but are not limited to) B-complex vitamins, vitamins A and D, folic acid, magnesium sulfate, calcium, thiamin and so many more. My Lab's Fat! Now What? Some Labs may get overweight if their dog food is too high in those fillers we mentioned earlier. By switching your kibble brand to a higher protein, lower carb, you will notice your Lab shedding those extra pounds. Of course, you will have to exercise him, as well. In addition, if your Lab loves those extra snacks and treats, or you're in the process of training your pup, give him healthy treats like bits of carrot, apple (with seeds, stem and core removed; these are toxic and can pose a choking hazard) or even bits of cooked chicken. These are all healthy choices when it comes to supplementing your Lab's diet. Plus, he will benefit from the "unprocessed" pure nature of the treat. Although, these four foods are top-notch, you can see why we've chosen the Merrick Grain Free. 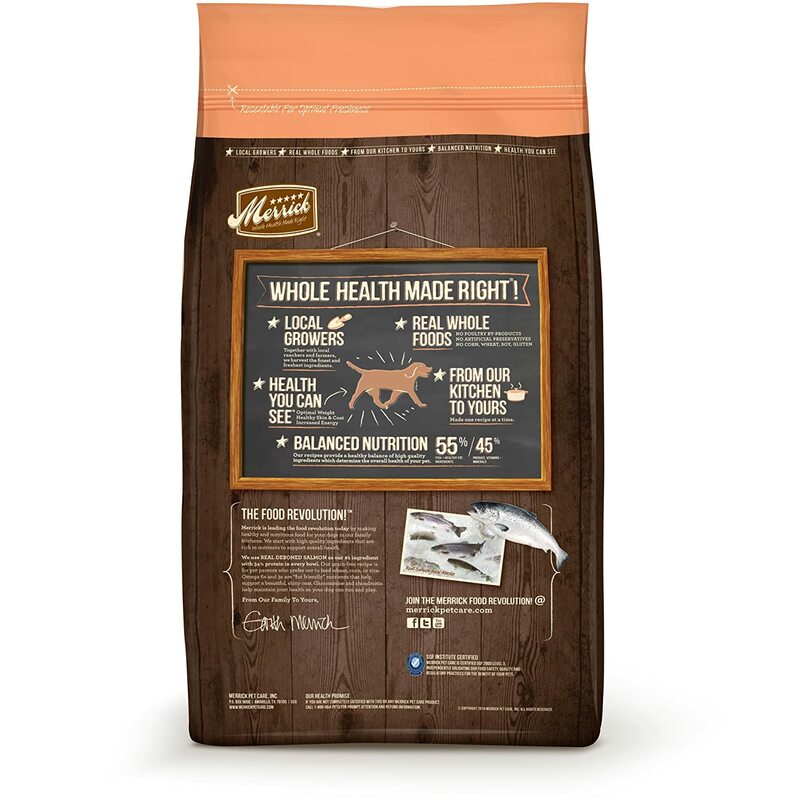 The many benefits and low cons make this dog food a healthy, quality choice for a Labrador Retriever and other canine breeds. However, not all dog foods may be right for all canines. Choosing the best dog food for your Labrador Retriever may take some time, research and trial-and-error. Read the labels to know exactly what you're feeding your dog. It will be well worth the effort when your Lab is happy and healthy. Check out this YouTube video on the popular Labrador Retriever.